The Harvest Moon is the first full moon that is closest to the autumnal equinox, but this year's moon will be a little later than usual. This 2017 Harvest Moon arrives on Thursday, October 5. 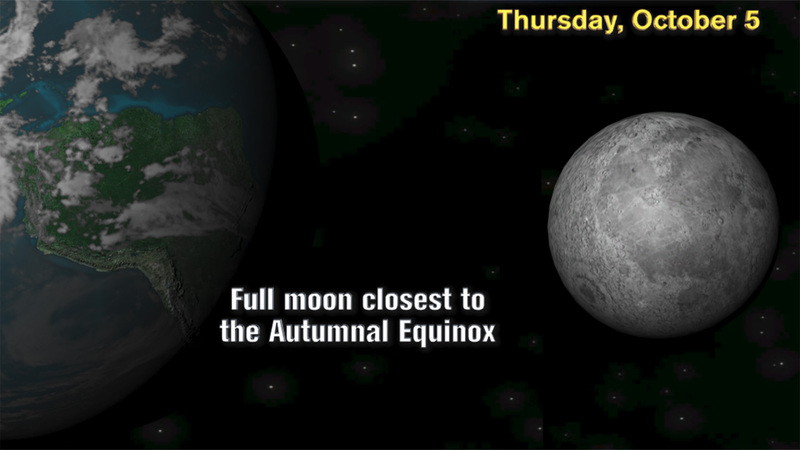 Usually, the Harvest Moon occurs in September, but this year, the October full moon arrived closer to the fall equinox. So, it takes home the Harvest Moon title. Technically, the moon will be 100 percent full at 2:40 p.m. which is still daylight for us, but the moon will still look fairly full after sunset. One thing that's unique about the Harvest Moon is the timing of moonrise - when the moon rises above the horizon - after the full moon. During a regular month, the moon normally rises about 50 minutes later each day. But after a Harvest Moon, the moon rises only 30-35 minutes later each day. To the naked eye, that lower difference in the moonrise timing will make it seem like we'll have a full moon night. The Harvest Moon isn't any bigger or brighter than your normal full moon. Like any other full moon, it does appear to have an orange tint in some cases as it rises along the horizon. When you look towards the horizon, you are looking through a greater thickness of the earth's atmosphere, compared to when you look up at the sky. That thicker atmosphere scatters blue light very efficiently, but it lets our eyes see more red. That's why the moon looks more orange.